Please explore our website to learn more about us, what to expect in class and how to become a member. Memberships are offered to adults, teens and children. Visitors are always welcome to observe our classes and ask questions of our instructors and members. Aikido is a modern Japanese martial art developed by the founder, Morihei Ueshiba (1883-1969; often referred to by his title ‘O-Sensei”). Therefore, Aikido is considered to be a “way” to develop one’s physical, mental and spiritual potential. Classes begin with breathing exercises and warm-up. Students then train with a partner, alternating as attacker (uke) and the one who receives the attack (nage) based on the technique demonstrated by the instructor. Rather than injure or harm the attacker with kicks or punches (as is the intent in other martial arts) the student is taught to blend with, redirect and transform the attacker’s energy, safely and effectively. Students learn to move from their “centers” and apply, among other things, the principal of spherical rotation in their movements. All in all, people practice Aikido for a variety of reasons, including to learn a martial art, as a form of exercise, stress relief, to improve physical balance, coordination and mental focus. Through Aikido, it is possible to achieve a sense of well-being that promotes a more balanced and healthy lifestyle. Most of all, Aikido is fun and exciting to do and can be practiced by the whole family. What we teach children is not brute force, not violence, but the cultivation of ki through mind-body training which will eventually build confidence, self-esteem and a sense of control over their lives. Aikido teaches boys and girls how to use their minds and bodies in new and healthy ways as they train with each other and help one another in a spirit of cooperation. 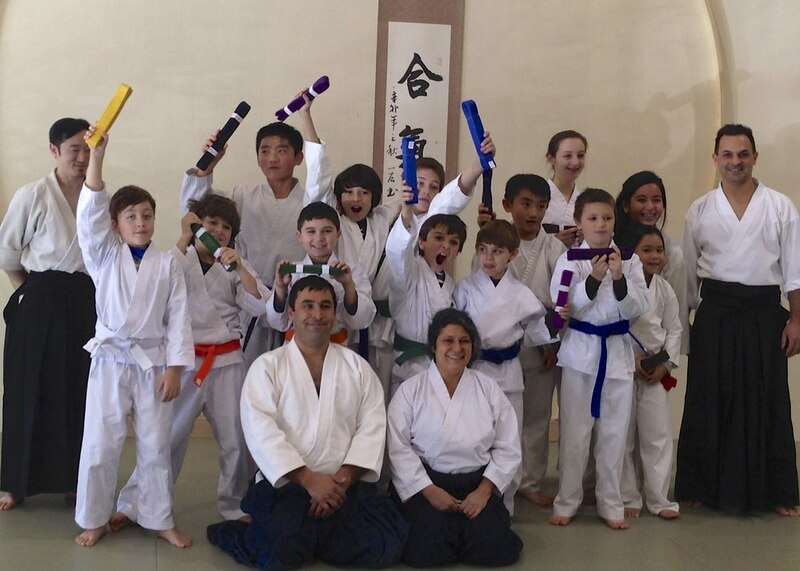 Kids learn how to practice a martial art without exhibiting violent or aggressive behavior. Unlike other martial arts, there is no kicking or punching with the intent to harm one another. Aikido’s circular, flowing techniques teach children balanced body movement, spatial awareness and focus. During all classes - kids and adults - parents and children are in full view of each other in a comfortable, open setting. Iaido is a non-combative physical and mental discipline based on a prescribed use of the traditional Japanese sword. The Japanese word Iaido is generally translated as “the way of mental and immediate reaction”. Because of its emphasis on precise, controlled, fluid motion which requires a meditative mindset, Iaido is sometimes referred to as “moving zen”. Iaido is practiced individually and in the form of katas (sequence of codified moves). The katas practiced include the elements of quickly drawing the sword from its scabbard and cutting (nukitsuke), removing the blood (chiburi) and returning the sword to its scabbard (noto). Many of the forms start from , and return to, a Japanese-style sitting position (seiza or tatehiza). Students of Iaido train with a dull-bladed Japanese training sword known as an Iaito. Advanced practitioners often train with a live or sharp-bladed sword known as a shinken. The main style of Iaido taught at Skylands Aikikai is Muso Shinden Ryu Iaido which was formulated in the early 1900’s by Nakayama Hakudo Sensei (1869-1958) and taught worldwide by one of his foremost students, Mitsuzuka Takeshi Sensei (1926-2008). Mitsuzuka Sensei founded the San Shin Kai (literally, “the sun, the moon and the stars”) of which Skylands is a member dojo. One of the first things a student will learn is the proper way to get dressed for class in order to “wear the sword”. This includes learning how to tie an obi and hakama so that the scabbard stays secure. In addition, the sword (iaito) needs to be properly cleaned and oiled before starting practice. Students also learn correct etiquette in the handling of the sword before, during and after class. Students practice repetitive, individual, cutting exercises with the sword called “suburi”. Learning the Iaido forms presents many challenges, including drawing the sword and returning it to its scabbard, the proper grip, proper posture and how to strike and cut with the sword. A student needs to develop a serious, but relaxed attitude in order to train in Iaido as it requires patience and time. People are attracted to the practice of Iaido for a variety of reasons. Some people have a fascination with the Japanese sword and culture and want to experience the art of swordsmanship. It is often said that one is to treat a sword as precious as one’s soul and that a sword is a tool to “polish or forge oneself “. As with Aikido, Iaido has its physical and mental benefits including improving one’s balance, coordination and mental focus. For some Aikido students, Iaido is an integral part of their training, although you do not need to do Aikido in order to do Iaido, or vice versa.